Research Assistant, Education Policy and Reform Unit. UNESCO Bangkok – Asia and Pacific Regional Bureau for Education. Programme Specialist, Education Policy and Reform Unit. UNESCO Bangkok – Asia and Pacific Regional Bureau for Education. Abstract: Peace has stood at the core of UNESCO’s mandate since its very inception almost 70 years ago. But how can this grand vision be translated into the reality of classrooms, schools and education systems? Earlier this year, UNESCO’s Asia and Pacific Regional Bureau for Education published a regional study on ‘Learning to Live Together’, that explores this question by looking at all levels of education systems – national policy frameworks, curricula, teacher policies and strategies, and assessment. The findings are drawn from ten countries in the region – Afghanistan, Australia, Indonesia, Malaysia, Myanmar, Nepal, The Philippines, Republic of Korea, Sri Lanka and Thailand – many of which could be relevant worldwide. In commemoration of the 2014 International Day of Peace, the following extract from the report entitled Learning to Live Together: Education policies and realities in the Asia-Pacific provides an overview on how education systems have, and can, work towards a more peaceful and sustainable world. Key Words: Peace, Education, Tolerance, Non-Violence, Quality of Education, Non-Cognitive Skills, Socio-Emotional Skills. In 1996, the International Commission on Education for the Twenty-first Century led by Jacques Delors (hereafter the Delors Commission) presented UNESCO with its landmark report Learning: The Treasure Within (hereafter the Delors report). The Delors report, written at the dawn of a new century, called for a critical rethink of the aims and the means of education. As the report claimed, education should be based on four fundamental pillars: learning to know, learning to do, learning to live together and learning to be. Nearly two decades later, the Delors report and its four pillars of learning have shaped policy debate and practice across numerous countries of the Asia-Pacific region and beyond, and continue to influence the education policies and practices of national governments and the work of international development partners including UNESCO, the World Bank and other international organizations. Of all the four pillars, the Delors Commission placed particular significance on Learning to Live Together (LTLT) which according to its authors, rests at the heart of learning and which may be viewed as the crucial foundation of education. “Learning to live together, by developing an understanding of others and their history, traditions and spiritual values and, on this basis, creating a new spirit which, guided by recognition of our growing interdependence and common analysis of these risks and challenges of the future, would induce people to implement common projects or to manage the inevitable conflicts in an intelligent and peaceful way” (Delors et al., 1996, p.22). The significance of the four pillars of learning, and in particular, LTLT, has certainly not decreased in recent years. Indeed, given the multivariate tensions and threats to peace and security in the 21st Century both at local and global levels, questions around the ultimate aims and means of education has led many to reflect on the tremendous need for empathy, respect for diversity and tolerance in our increasingly interconnected world. This is reflected in the importance placed on Global Citizenship Education (GCE), including via the UN Secretary-General’s Education First Initiative, which considers the fostering of Global Citizenship a global priority. Despite the significance of LTLT in the 21st Century, and despite numerous international initiatives to nurture LTLT competencies, there exists little information on how this supposition is effectively translated into national policies and curricula, and eventually into the reality of schools, including teaching and learning practices. This report is a response to this gap and attempts to understand how ten selected countries – Afghanistan, Australia, Indonesia, Malaysia, Myanmar, Nepal, The Philippines, Republic of Korea, Sri Lanka and Thailand – have reflected and integrated LTLT into their education systems by mapping existing education policies and initiatives. By exploring a number of areas, namely policy, curricula, teachers and assessment, this report aims to identify what has so far been achieved in education systems of the ten selected countries in the area of LTLT and where further analysis may be required. The approach, based on the Delors report definition, assumes that LTLT occurs through the two complementary processes: the ‘discovery of others’ and the ‘experience of shared purposes’ which lead to the development of key illustrative competencies including empathy, cultural sensitivity, acceptance, communication skills, teamwork and leadership, among others as illustrated in figure 1. With regard to the four areas of education systems examined, the report findings illustrate how LTLT, through these complementary processes, is promoted in national education systems. The report findings indicate that all ten selected countries emphasize the importance of education in building peace, unity and social cohesion either through national constitutions or via education legislation and policy frameworks. These span across several themes such as peace, human rights, gender, environment and disaster risk reduction. In Afghanistan, the 2008 Education Law provides reference to the importance of tolerance, non-discrimination, respect for human rights, the protection of women’s rights and ethics based on Islamic principles. In Sri Lanka, the National Education Commission (NEC) has initiated nine National Goals that seek to ensure the right to quality education built upon the four pillars of learning as identified in the Delors report. In Thailand, the National Education Plan (2002-2016), which serves as a framework for implementing education reform, lays out three objectives and eleven policy guidelines for their implementation. Under the first objective, guidelines reflect LTLT by referring to the purpose of education as “inculcating and strengthening morality, integrity, ethics, and desirable values and characteristics” in students. Australia’s more recent Melbourne Declaration provides explicit reference to the shifting global dynamics requiring ‘21st Century learners’ to develop essential 21st Century skills, many of which reflect LTLT illustrative competencies. Malaysia has implicitly acknowledged the importance of LTLT competencies in its Preliminary Report: Malaysia Education Blueprint 2013-2025 and how these competencies form part of a national vision for education. As the review serves to illustrate, all countries recognize LTLT either explicitly or indirectly in their national policy frameworks. The findings also suggest a strong focus on national unity. While this is promising, there may be need for caution in defining the purpose of education so as to ensure that it promotes not only love of the country, but also of diversity both within and beyond national borders. While it is not perhaps surprising that overarching national policy frameworks reflect the LTLT philosophy albeit perhaps to varying degrees and in differing ways, what is arguably more telling is the ways in which this philosophy is translated into school curriculum. Across the ten countries, LTLT and its illustrative competencies are generally well acknowledged at the curriculum level. Increasing attention is being paid to values and attitudes, or so-called ‘socio-emotional skills’ and competencies in the curriculum. This is particularly the case in countries where curriculum reform has occurred in recent years. Increasingly, a multi-dimensional conceptualization of the curriculum through which subject content is reduced to allow for the greater emphasis of cross-curricular skills and competencies is occurring. At the same time, the greater inclusion of specific subjects on values, civics and citizenship education, as well as moral, ethics and religious education is acknowledged. The report findings suggest that opportunity to study different religious faiths and traditions help promote understanding among students of different religious groups, that ‘carrier’ subjects such as history, second or foreign languages and the social sciences, as well as physical education and art are also critical to the fostering of LTLT competencies in these countries. The degree to which LTLT is reflected in curricula varies, however, and given that LTLT is often incorporated into ‘carrier’ subjects, it may still be difficult to accurately assess how LTLT is effectively translated from national policy to the school curriculum. In the broader sense, Australia’s new curriculum demonstrates three cross-curriculum priorities (Sustainability, Asia and Australia’s Links with Asia and Aboriginal and Torres Strait Islander Histories), as well as seven general capabilities including ‘Critical and Creative Thinking’, ‘Intercultural Understanding’ and ‘Ethical Behaviour’ (ACARA, 2012), all of which are directly linked to the illustrative competencies of LTLT. For Thailand, the new national curriculum set to be implemented in the 2014 academic year has also placed emphasis on morals and values. This is not dissimilar to the Philippines; here, the philosophical basis of the curriculum is founded on the four pillars of education. The K to 12 Curriculum, designed to address the demands of a knowledge-based economy, places a stronger focus on the socio-emotional domains. In reviewing LTLT competencies reflected in national curricula, it is also important to note that while some countries have specific subjects dedicated to LTLT competencies such as peace and education, civics, human rights or moral education, others may rely upon ‘carrier’ subjects such as social science and history for the less explicit transferal of LTLT illustrative competencies. In Myanmar, for example, a module on ‘Union Spirit’ was introduced under the subject of moral and civic education to promote national solidarity through building trust, friendship and mutual understanding. For other countries, LTLT may be ‘carried’ through subjects including music, art and physical education. Despite this, the findings gathered from the country reports indicate that on average, dedicated subjects, and to some extent both academic and non-academic ‘carrier’ subjects, are allocated less time in school timetables than subjects such as language, mathematics and science. Given the roll out of a ‘21st Century-inspired’ curriculum in several countries, including Australia, Indonesia and Thailand, it is possible that this traditional focus may begin to bend in the direction of LTLT through either specialized or ‘carrier’ subjects in the ten selected education systems, or perhaps both. While the review has confirmed that teachers, teacher education and teaching methods all play a significant role in transferring LTLT competencies in the classroom, there remains a significant information gap prohibiting an accurate assessment of how teacher policies, especially teacher training and selection, truly reflect LTLT among the selected countries. It is clear, however, that LTLT-related subjects often require innovative and creative teaching practices which in turn, require greater time for teachers to prepare adequate lesson plans and gather necessary materials. Simultaneously, participatory and collaborative learning requires a shift away from traditional ‘chalk and talk’ teaching methods. This suggests need to invest in both pre- and in-service teacher training, and in particular, continuous training opportunities that are monitored to ensure that the benefits of such teaching strategies are understood and fully tapped. Of upmost importance to the development of LTLT competencies in students is the role of teachers, as well recognized in each of the ten countries under analysis. In the first instance, this is reflected in teacher training. In Malaysia, for example, strong focus is placed on ‘values and attitudes’ as an important consideration in the selection of teacher trainees. Teacher training colleges, which provide training in professional ethics, values and respect for diversity, serve to inculcate the LTLT culture among teachers. This is also reflected in Nepal, with its particular focus on ensuring teachers promote ‘equity and social inclusion’ through mother tongue instruction policies in local communities. In this regard, the ‘Life Skills Based Health Education: Trainer’s Manual for Primary Level’ covers a number of important skills. In the Philippines, the pre-service Teacher Education Curriculum course ‘Social Dimensions of Teaching’ includes a specific focus on LTLT and the four pillars of learning. Other examples demonstrate the continual promotion of LTLT in teacher training. In the Republic of Korea, for example, the policy guidelines on ‘Major Directions for Training of Teaching Personnel’ encourage local education offices to produce their own in-service training programmes on human rights. Despite these numerous positive examples, findings also indicate that although there may be significant reference to the need for teachers to promote LTLT and perhaps also opportunities to help teachers to do so, it is unclear to what extent teachers effectively transfer these competencies in classroom settings. For example, while the findings generally indicate that teachers show a positive attitude towards student centred teaching approaches, the data also shows that the extent to which these are applied depends on the skills and attitudes of teachers as well as their interest in these methods. And, even where there may be clear frameworks for student-centred teaching and learning strategies that promote collaborative and participatory methods, this does not always translate to effective LTLT teaching in the classroom. For example, the country report for Sri Lanka indicates that only two thirds of teachers interviewed were applying student-centred learning, mainly due to a lack of time in lesson planning and preparation. In Nepal, the country report suggests that while there are in-service teacher training programmes that are highly relevant to LTLT, teachers may lack an understanding of how these concepts are practically applied. With regard to Media and Information Literacy (MIL) for the development of LTLT, significant variations exist across countries. In Afghanistan, for example, the country report suggests that there is little critical analysis of the media, and issues of access to media and information rise especially in rural areas, where newspapers are not published or distributed and multimedia materials such as CDs and DVDs cannot be used in schools due to limited access to electricity. In addition, teachers do not always master MIL competencies and thus, may not adequately explain to their students that information is shaped by the different points of view of those who own media outlets. This is in stark contrast to the Republic of Korea, where MIL is widely used in teaching and learning. In this context, teaching is geared towards the utilization of websites, ICTs, mobile technology and applications to gather and share information for learning purposes. Overall, the findings of this report suggest that assessment of LTLT’s illustrative competencies at both national and school level remains limited across all ten countries. Indeed, traditional tests, which may not assess LTLT competencies such as teamwork, leadership and community involvement, remain the predominant mode of assessment. Nonetheless, some examples demonstrate a move toward the greater incorporation of LTLT competencies in school assessment in line with greater focus on LTLT competencies in international discourse. In Australia, for example, the National Assessment Programme (NAP) tests students’ skills and understanding in a number of areas including ‘Civics and Citizenship’. In the Philippines, the K to 12 curriculum framework and its guiding principles provide a system that is learner-centred and includes indicators on competencies related to LTLT (SEAMEO INNOTECH, 2012). In schools, Afghanistan demonstrates some reliance on national examinations as a means to test knowledge of content from textbooks and memorization, which may not necessarily reflect their level of knowledge and understanding of relevant LTLT concepts. Assessment structures in Myanmar were also found to reflect a similar approach. In Indonesia, on the other hand, discussions with teachers in Banten, Jakarta and West Java provinces as part of this research indicate that there is room to test LTLT competencies. For instance, a student’s final grade for each subject is calculated through the following weighting system: 30% school–based assessments, 20% on student attitudes, and 50% on national examinations. The findings of this report ultimately suggest that little focus is placed on the assessment of LTLT competencies in schools. At the same time, a lack of monitoring of both assessment practices and grading in many of the selected countries may inhibit the capacity of education systems to accurately assess student progress objectively. Given the greater focus being placed on LTLT competencies in national policy frameworks, curriculum, teachers and of course, at the international level, it seems this may be an area for further development across all ten countries. National Policy Frameworks: There is need to ensure that national policy frameworks, while suited to each country context, recognize the global dimension of education and its potential for building peace and embracing diversity and differences. Curriculum: It is important to integrate LTLT through the incorporation of the illustrative competencies across the entire curriculum while ensuring that subject content is relevant to, inclusive and representative of a country’s diverse cultures. Teachers: Investment in the capacity development of teachers will help increase knowledge of themes related to LTLT, as well as increase the transfer of LTLT competencies in the classroom through effective teaching strategies. Assessment: Improving assessment of LTLT competencies, through the exchange of experiences and innovative practices, as well as methods to strengthen and monitor learning assessments – via either school-based or large-scale national assessments – is important. Ultimately, this report seeks to engage policy makers to reflect on the findings and considerations provided so that they may generate forward momentum in the promotion of LTLT in education systems. Such momentum may facilitate wider discussion across the Asia-Pacific region around actionable steps such as the measurement and eventual benchmarking of relevant competencies. It is also hoped that this report will reinforce what the Delors Commission saw as the ultimate purpose of education: an exceptional means to bring together individuals, groups and nations to build a more peaceful, prosperous and equal society. SEAMEO INNOTECH. 2012a. K to 12 Toolkit: Reference Guide for Teacher Educators, School Administrators and Teachers. Quezon City: SEAMEO INNOTECH. 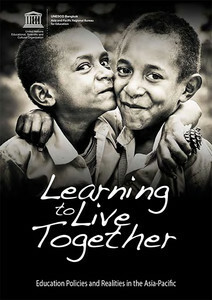 Learning to Live Together is an important part of the IB curriculum for international schools. Teaching children early on to celebrate differences and to be tolerant of other cultures is crucial in developing global citizens.